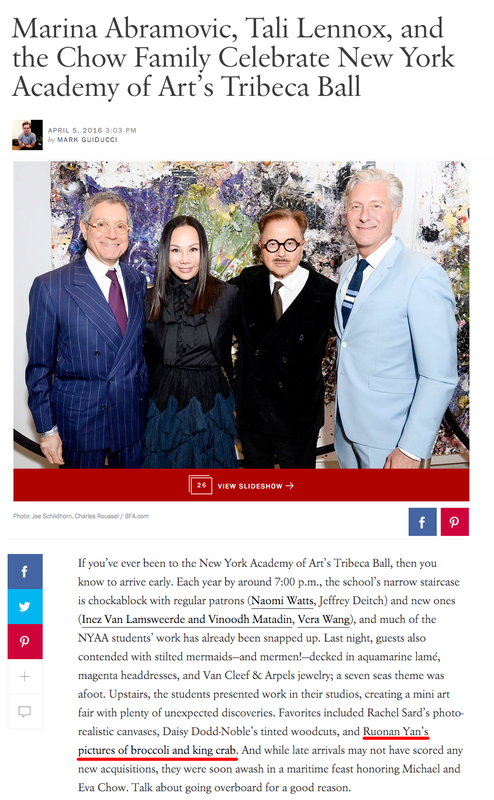 On the Tribeca Ball 2016, an annual fund raising party of New York Academy of Art, also one of the biggest even in New York City, Ruonan Yan's works were impressed by many guests. Her work "Broccoli " and "West Wind Rustle 西风响 " are featured on the next day Vogue article. It's such a honor to be featured in one of the most important press in the world. Among over 100 artists on the show, three of them left deep impression to the writer Mark Guiducci. The next day of the article publishing, Broccoli was purchased by a private collector right away.